ממוקם בליבה של ניס. המלון נמצא במרחק של צעדים ספורים מן העיר העתיקה. LocationOverlooking the Mediterranean Sea. 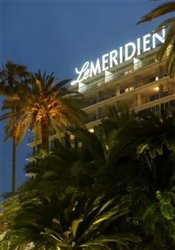 the Le Meridien Hotel Nice is located in the heart of the city and is just few steps from the old town. Most of the famous shopping malls. outstanding restaurants. beaches and many other interesting places are also exceptionally placed within walking distance from the hotelRestaurantThe beautiful as well as famously acclaimed in-house restaurant offers an extensive range of signature cuisine for its patrons to enjoy. The hotel's trendy bar offer a comprehensive selection of interesting cocktails to create a setting of unparalleled style and flare.GeneralWith its exclusive as well as elegantly furnished meeting and banquet rooms. 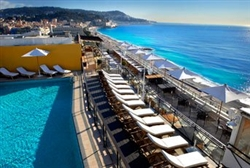 Le Meridien Hotel Nice is famously known for its capability in hosting events from company incentive trips to conventions. seminars and receptions. 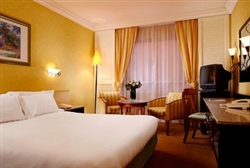 You can also enjoy by utilising the leisure facilities like the swimming pool. solarium. gymnasium as well as sauna that are located on-site.